G'day folks, stumbled across this forum recently and thought I'd join up from across the Pacific (Australia). 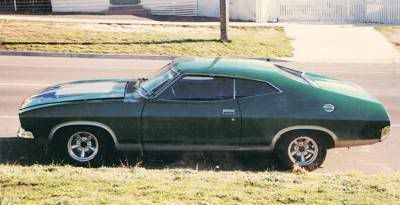 Always loved 2 door Ford muscle cars and at age 21 (23 years ago) bought myself a 1970 Mach1 which had been converted to right hand drive as mandated by the laws here at the time. Had that car for five years but reluctantly sold it to get a house deposit. 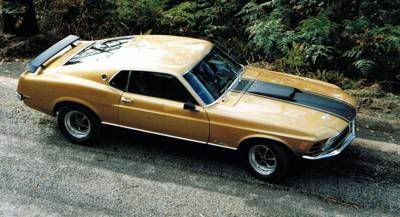 When I had the 70 Mach 1 I always thought of the 71 - 73 Mustangs as being rather uninspiring in design, but in the years after that cars departure I began to see the later models with a different eye, and swore that if I ever got another 'stang it would be one of these. A year ago I came to the realisation that I had some cash to burn and saw my current ride for sale on eBay by a guy who had just imported it. It started it's life as a 1972 Olympic Sprint model (302W 3-spd toploader) but is now painted yellow with interesting non-standard Grabber stripes. I love the new scheme and have no desire to change it back to original. Ten years ago Left Hand Drive vehicles over 30 years old became legal to drive here in Oz so the car will stay LHD (only really a problem in a RHD country when overtaking). The biggest issue with having the Mustang is that every second person on the street wants to stop you and talk about it when sometimes you just wanna be left alone! There are many Mustangs down here but not so many 71 - 73 models, in fact so few that many people don't even recognise the distinctive 72 shape as being that of a Mustang. I'm mainly active on the Australian Mustang forum, but might drop in here every now and again for a look-see. In case anyone is interested I just posted a tutorial there on how to convert fastback fixed quarter windows to wind down ones from a coupe - very cool to have a pillarless Mustang! Welcome to the forums! We are glad to have you aboard! Your car sounds great...can't wait to see more pics! Thanks for sharing the very IMPRESSIVE tutorial on converting the fixed window to "roll down" - - Excellent post. I look forward to interacting with you on the Forums. Again, Welcome! Welcome! That's a cool story and your car sounds great! It looks like there is something different about your hood too in the above pic. Looking forward to more pics & thanks for the tutorial. Oh, BTW...your tutorial on quarter windows would be great in our Wiki also! I know I could not.